The drug is derived from thebaine and has an extremely high affinity for Î¼-opioid receptors in the central nervous system. Naltrexone can be described as a substituted oxymorphoneâ€”here the tertiary amine methyl substituent is replaced with but-2-enyl. Naloxone is a Î¼-opioid receptor competitive antagonist, and its rapid blockade of those receptors often produces rapid onset of withdrawal symptoms. 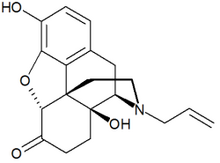 Naloxone also has an antagonist action, though with a lower affinity, at Îº- and Î´-opioid receptors. Naloxone is injected, usually initially intravenously for fastest action. The drug acts after about two minutes, and its effects may last about 45 minutes. Naloxone has been distributed as part of emergency kits to heroin users, and has been shown to reduce rates of fatal overdose. The drug also blocks the action of pain-lowering endorphins which the body produces naturally. The likely reason for this is that these endorphins operate on the same opioid receptors. In one experiment, women treated with naloxone reported higher pain levels during childbirth than women not so treated; in another experiment, the pain lowering effect of placebos was blocked if the placebos were administered along with naloxone. While naloxone is still often used in emergency treatments for opioid overdose, its clinical use in the long-term treatment of opioid addiction is being increasingly superseded by naltrexone. Naltrexone is structurally similar but has a slightly increased affinity for Îº-opioid receptors over naloxone, can be administered orally and has a longer duration of action. The patent for Naloxone has expired and it is manufactured by various companies. The CAS number of naloxone is 465-65-6; the anhydrous hydrochloride salt has CAS 357-08-4 and the hydrochloride salt with 2 molecules of water has CAS 51481-60-8. Naloxone has sometimes been mistakenly called "naltrexate." Investigators at Harvard found that most medication errors occur when a physician inaccurately ordered a medication (39 percent) or when a nurse mistakenly administered a drug (38 percent). (c) More important, the Harvard study also reported an often-overlooked finding: almost one-half of all inaccurate physician orders are intercepted, predominantly by nurses, before these mistakes reach the patient. By contrast, only 2 percent of errors nurses make when administering a medication are intercepted, making the risk of error far greater at the patient's bedside. Of the tools that are available today for reducing medication errors, one of the most effective is a new bedside technology called bar-code point-of-care (BPOC) technology. Bar codes have been used in most U.S. industries since the 1920s and are applied routinely to improve hospital inventory, supply, and charge capture. In 2003, JCAHO established six national patient safety goals, the first of which is to improve the accuracy of patient identification whenever administering medications or blood products--a core functionality of a BPOC system's technology. In addition, a bar-code system can help healthcare organizations meet JCAHO medication-use standards and satisfy requirements related to error reporting for process improvement. Based on the foregoing considerations, administrators at Sacramento, Calif.-based Sutter Health undertook a patient-safety initiative to minimize medication errors, including implementation of a BPOC system. Following recommendations of the IOM, the National Quality Forum, and the Leapfrog Group, Sutter Health began its initiative by installing a computerized physician order entry (CPOE) system to prevent physician errors in prescribing medications. Although Sutter Health was convinced of the benefits of CPOE, the health system also recognized its inherent complexities and limitations. For example, CPOE would require significant human and capital outlays--the one-time cost of implementing a commercially available CPOE system in a 500-bed hospital can he as much as $7.9 million, with ongoing costs approaching $1.3 million. (h) Other challenges include a lengthy implementation time frame, risk of incomplete implementation due to limited user acceptance, and inherent restriction of error reduction at the front end of the medication process. These concerns provided the impetus for Sutter Health's adoption of BPOC. In accordance with the findings of the Harvard study cited previously, Sutter Health's administrators acknowledged that even if CPOE were to completely eliminate errors from physicians' orders, without a bedside solution, nurses could still execute these "perfect" orders on the wrong patients. Therefore, to minimize medication errors where they were most likely to occur, Sutter Health decided to pursue BPOC simultaneously with CPOE. From a business perspective, Sutter Health's administrative decision makers determined that implementing BPOC immediately was compelling because it would cost a fraction of a CPOE system, would be highly effective at reducing medication errors, and could be implemented in a hospital in only six to nine months. This rapid implementation time would allow the organization to achieve immediate bedside safety while the longer CPOE implementation process was being completed. BPOC systems range in sophistication from simple "five rights checkers" (right patient, right drug, right route, right dose, and right time) to systems that offer clinical decision support and address all types of common and undesirable bedside occurrences. The system also offered the capability to check the safety of bedside activities beyond medications, including positive patient identification for blood transfusions and specimen tracking. This added capability provided a rationale for BPOC infrastructure costs beyond just reducing medication errors. To minimize implementation risks, Sutter Health selected a vendor that already had a proven track record of implementing BPOC systems at dozens of hospitals. In addition, and perhaps most important, Sutter Health involved nursing staff in the product-selection process. Nurses who reviewed the product were enthusiastic about its workflow and capabilities, and strongly supported its use at the bedside, helping to ensure successful implementation. Sutter Health's implementation of BPOC is proceeding rapidly according to expectations. Within nine months of the start of implementation, six Sutter Health hospitals were live on the BPOC system by the end of November 2003, and another four sites are in the early stages of implementation. The time devoted to working out corporate standards for the initial implementation sites has helped reduce implementation times at other sites. Sutter Health anticipates that BPOC will be implemented at all of its hospitals by the end of 2004 or early in 2005. Sutter Health anticipates achieving numerous benefits with BPOC. The technology will not only immediately reduce bedside medication errors, but also substantially heighten awareness of near-misses. Understanding the type and circumstances of errors intercepted by BPOC will provide insight into potential systemic issues that cause the errors to occur. The resulting reduction in errors will produce a substantial financial benefit by reducing costs associated with medication errors. Patient satisfaction. BPOC also will help alleviate patients' fear of medication errors because it involves a familiar and easily understandable technology. Patients will interact with the BPOC system as nurses scan their wristbands and medications at the bedside. They therefore will be able to witness the benefits of the technology firsthand, and be comforted with the intuitive recognition of the accuracy provided by bar codes. Moreover, once patients have experienced medication administration, blood transfusion, and laboratory specimen collection with a BPOC system, they will come to expect it. Sutter Health anticipates that the confidence instilled in patients by the technology will translate into greater patient loyalty and an influx of new patients to the health system as satisfied patients recount their positive experiences to others. Nurse retention and satisfaction. Sutter Health perceives that BPOC systems not only afford patients added safety, but also protect a shrinking and essential resource pool--registered nurses. The organization acknowledges that hospitals wishing to survive the current nurse staffing crisis must establish themselves as premier institutions. The expanding patient base is just one indicator of such excellence. Investing in technology to enhance patient and staff safety is another, projecting a corporate image of care and attention. Sutter Health is already reaping the benefits of improved nurse satisfaction, as many nurses have voiced appreciation for the BPOC system. Linda Goble, RN, a nurse at Sutter Roseville, offered the following praise: "This technology provides nurses with consistent backup to help better care for patients and make medication delivery even safer." Other benefits. The clinical benefits of BPOC technology also go beyond improving medication safety. The wireless network infrastructure and point-of-care devices now in place at many Sutter hospitals has enabled the organization to roll out a more comprehensive patient care system to improve care and streamline administrative tasks. This more extensive system facilitates bedside verification of accurate blood transfusions and positive identification of laboratory specimens. In addition, the BPOC system provides highly accurate usage data that can be evaluated in combination with data from registration, pharmacy, laboratory, finance, and medical records systems to perform electronic disease management studies and drug-utilization reviews. These data permit Sutter Health to review clinical compliance with established best practices and eliminate waste from ineffective medication use, inaccurate specimen draws, and other errors. Sutter also envisions significant administrative benefits from BPOC. For example, the BPOC system allows the organization to capture respiratory therapy treatments and other point-of-care services and trigger a charge transaction as a by-product of the administration process. Charging upon actual use or treatment eliminates tedious reconciliation and charge-back procedures and improves charge accuracy. Ultimately, Sutter sees the potential to use real-time data from the BPOC system to update medication and supply inventories for improved materials and supply-chain management. Sutter Health found that the technical and time commitments of BPOC system implementation are minor compared with the challenges and risk associated with other system installations. The medication administration process may be slowed slightly as nurses respond to the system's warnings and alerts issued by the system, but this time loss is balanced by automated documentation of medication administrations. In most instances, nurses have mastered the system in as little as two hours of training. Sutter accomplished a hospitalwide BPOC system implementation in six to eight months. The greatest challenge to BPOC implementation is the need to bar-code unit-dose medications. However, the task is not as difficult as commonly perceived. Although the U.S. Food and Drug Administration (FDA) and others report that only 35 percent of medications are bar-coded by manufacturers, Sutter Health found that manufacturer bar-coded line items account for nearly 60 percent of all oral and injectable medications administered in hospitals. Sutter continues to bar code the remaining doses at a cost of about five cents per dose. Because Sutter delivers 32 million doses annually, these remaining doses cost the organization about $1.6 million each year. However, when the FDA issues its final rule later this year requiring manufacturers to place bar-code labels on medications bound for hospitals, that per-dose cost is expected to fall to one cent. Meeting organizational, regulatory, and community patient-safety needs depends on an approach that considers the perspectives of all individuals involved in the patient-care process. From the physicians' perspective, a CPOE system is a key to promoting patient safety. On the other hand, a BPOC system offers a cost-efficient and easy-to-implement bedside approach to ensure patient safety that more directly addresses the concerns of nurses and patients. The best approach to acquiring a BPOC system can be identified by considering the medication use process, the availability of current technology, its cost, and the length of time and effort needed to successfully implement the technology. Patient safety should be a fundamental element in any hospital's philosophy, mission, and vision, Use of barcode point-of-care technology (BPOC) to reduce medication errors is a patient-safety approach that hospitals can implement within a short time frame and obtain immediate benefits. Advantages of BPOC are that it is intuitive, cost-effective, and conducive to improved patient satisfaction. Surfer Health is a not-for-profit healthcare network of 26 acute care hospitals. Headquartered in Sacramento, Calif., the health system provides services to more titan 100 northern California communities, with one affiliate in Hawaii. The system also includes physician organizations; medical research facilities; regionwide home health, hospice, and occupational health networks; and long-term care centers. (a.) Top Patient Concerns 2002 Omnibus Survey Results, Bethesda, Md. : American Society of Health-System Pharmacists, June 18, 2002. (b.) Barker, K. N., Flynn, E. A., Pepper, G. A., Bates, D. W+, and Mikeal, R. L., "Medication Errors Observed in 36 Health Care Facilities," Archives of Internal Medicine, September 9, 2002, pp.1897-903. (c.) Leape, Lucian L., Bates, David W., Cullen, David J., and others, "Systems Analysis of Adverse Drug Events," JAMA, July 5,1995, pp. 35-43. (d.) 14th Annual HIMSS Leadership Survey, Healthcare Information Systems Society, February 10, 2003. (e.) Johnson, Connie L., Carlson, Russell A., Tucker, Chris L., and Willette, Candice, "Using BCMA Software to Improve Patient Safety in Veterans Administration Medical Centers," Journal of Healthcare Information Management, January 2002, pp. 46-51. (f.) Federal Register, March 14, 2003. (g.) Pedersen, C. A., Schneider, P. J., and Scheckelhoff, D. J., "ASHP National Survey of Pharmacy Practice in Hospital Settings: Dispensing and Administration-2002," American Journal of Health-System Pharmacists, January 1, 2003, pp. 52-68. (h.) Computerized Physician Order Entry: Costs, Benefits, and Challenges, prepared by First Consulting Group for the American Hospital Association and the Federation of American Hospitals, January 2003. (i.) Drug Week, December 20, 2002. Van R. Johnson is president and CEO, Suffer Health, Sacramento, Calif.
John Hummel is CIO, Suffer Health, Sacramento, Calif.
Terance Kinninger is the former COO, Bridge Medical/ Amerisource Bergen, Solana Beach, Calif.
Russell F. ("Rusty") Lewis is president, Amerisource Bergen Information Technology Group, Valley Forge, Pa. Questions or comments about this article may be sent to Jamie Kelly at jkelly@bridgemedical.com.